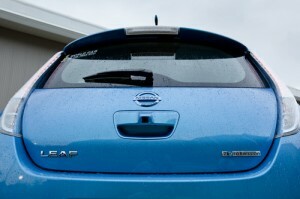 The Nissan Leaf is the world’s first mass-production EV. This time, is the electric car here to stay? Electric vehicles may be a relatively recent addition to the mainstream automotive marketplace, but the technology is hardly brand new. Indeed, electric propulsion was among the earliest solutions for motivating vehicles, dating back to the late 19th century, when electric vehicles were as common as gas-powered ones. But petroleum has its advantages over electricity, among them quicker refueling time and longer range. As a result, electrically powered vehicles experienced a century of decline before rebounding recently, bolstered largely by growing public concern about the environmental impact of conventional automobiles and the pollution generated by their internal combustion engines. 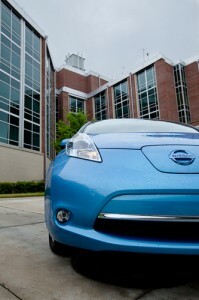 So in 2011, Nissan became the first major automaker to market a mass-produced EV here in the US. The Leaf is a four-door, five-passenger hatchback powered exclusively by an 80kW (about 107 horsepower) AC motor. I recently had a chance to spend some time with the Leaf to find out what it’s like to drive a modern EV, and whether or not the Leaf would be a suitable replacement for one of the two gas-powered vehicles currently serving my household. That involved not just commuting the short distance from my home to my office on battery power, but also running errands in town and taking a highway trip to the suburbs, a round-trip journey that nearly depleted the Leaf’s relatively short range. To get a better sense of how owners use their EVs, I also spoke with some electric vehicle enthusiasts at the annual Georgia Tech Auto Show. The 2012 Nissan Leaf SL test vehicle has a relatively high base price of $37,250, but buyers may be eligible for a $7,500 federal tax credit. When considering the economics of electric driving, I factored the full tax credit in and assumed a new Leaf would cost about $30,000 to purchase. A wide range of safe, comfortable, well-equipped and relatively economical vehicles can be purchased for thirty grand. While the Leaf – which shares a platform with the compact Versa hatchback – is not the largest among them, it makes up for its small size with generous standard equipment. A backup camera, front and rear heated seats, keyless entry with push-button start and touch screen navigation are all standard. Along with upscale exterior features like 16-inch alloy wheels, fog lamps and LED headlights and taillights, the Leaf’s feature-rich and finely finished interior gives it a premium feel. And it’s not too small. A high roof and lots of glass give the cabin a feeling of openness. The rear seat legroom is not great, but my two forward-facing car seats and their three-year-old occupants fit with no problem. The cargo area is big enough for three, carry-on sized rolling suitcases. The rear seats fold to accommodate more cargo. Safety equipment that includes six standard airbags earns the Leaf the highest possible 5-star government safety rating. 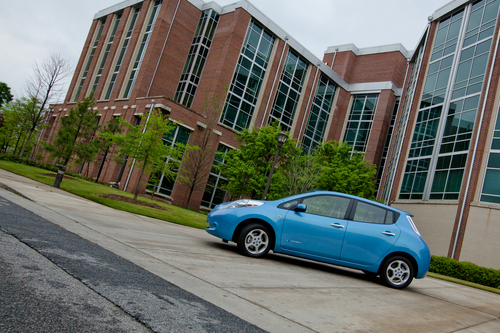 The Insurance Institute for Highway Safety also named the Leaf a Top Safety Pick for earning the highest possible score in each of their tests. 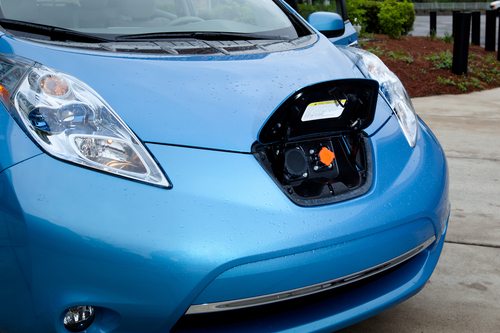 In terms of comfort, equipment and safety, the Leaf stacks up nicely to its conventionally powered competition. Its limiting factor – and the big hurdle for many would-be EV buyers – is its limited range. Nissan says the Leaf can travel about 100 miles on a full charge. My experience with the test car, confirmed by more seasoned Leaf drivers, showed that number to be optimistic. It may be more like 70 or 80 miles. Recharging from nearly empty can take 12 hours. But for many drivers, a 70-80 mile range is fine for typical commuting and driving on errands. It may not be a long-haul road trip vehicle, but its limited range would not disqualify the Leaf from duty in my two-vehicle household. 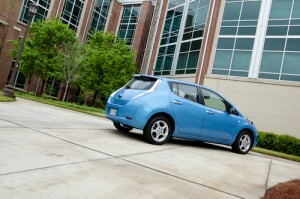 I’d simply use the Leaf as frequently as possible, with the gasoline car filling in on longer trips. The reason is because EVs are remarkably inexpensive to operate. 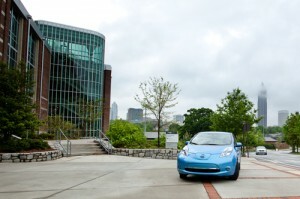 A Leaf owner I spoke to at the Georgia Tech Auto Show said he spent $17 on electricity to drive his Leaf 1,100 miles in December, a colder month when EVs run less efficiently. A 30-mpg gas car would use about $140 in fuel to go the same distance. He admitted that he took advantage of off-peak electricity rates, but said without the discount, the power would still cost only $30. Its low cost of operation makes the Leaf appealing from an economic perspective, and driving the EV stirred my emotional interest in electrics. Sure, it’s a normal car, but the experience is decidedly unique. 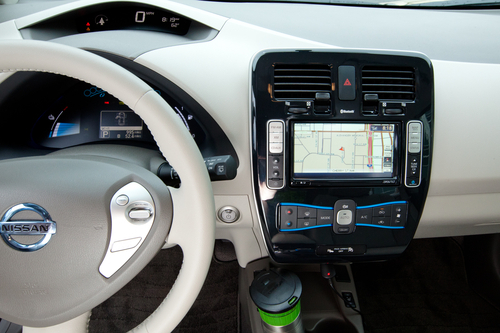 The Leaf more boots up than starts, a chime and icon on the digital display indicating that it’s ready to roll. A console-mounted “hockey puck” is used to select reverse or one of two forward drive modes, normal or eco. 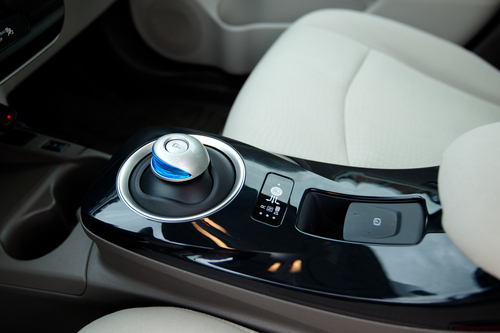 The latter requires the driver to push deeper into the accelerator pedal to move the Leaf quickly off the line. But eco mode also increases brake regeneration, handy on hilly Atlanta streets where I could coast downhill without braking. One of the Leaf’s coolest attributes is its silence. “Idling” at a red light is a completely different experience with no engine noise or vibration whatsoever. Even under full power, the EV is remarkably quiet, with just a faint whine that increases in pitch along with speed. I drove to work one morning without using the radio just to enjoy the serenity and to contemplate the sound of future roads, full of whirring EVs. Upon returning home each evening, I plugged the Leaf in with the standard 120V charger, the slowest way to recharge. A quicker charge requires a dedicated 240V circuit and the corresponding charger. Charging took as long as 12 hours, but was no inconvenience at night. My longest trip in the Leaf began with a full battery, the Leaf’s display showing 97 miles of range. Upon returning from the 64-mile round trip, the display had stopped providing me with an estimated range. It simply advised me to stop and recharge. Still, the Leaf is totally practical for 90% of the driving that I do, and extremely economical to operate. It seems logical that electricity rates will eventually be affected by a growing number of EVs on our roads. But for now, a dime’s worth of electricity buys a dollar’s worth of gas. That’s an equation that means EVs are all but certain to make a big comeback. After a few days behind the wheel of the Leaf, this driver welcomes the return of the electric car. Photography courtesy of Dave May. See the full gallery. Once again a thorough report from Nick. Interesting to note the dime to the dollar comparison. If I lived in a city, this would be a no brainer for me. I have owned my LEAF for 2 months now. That dime to dollar comparison is not far off. I am saving over $400/month in gas. My electric only went up $30 to 40/month. That is a large savings/month. Add to that no oil, filter changes etc. This car is hard to beat for a daily driver. Has become my primary vehicle. It is also very fun to drive. Thanks for visiting and sharing your experiences, Macinator. I’m interested to know if the Leaf replaced another vehicle for you, or what other vehicles are currently serving your household. How many miles per week would you say you’re putting on the Leaf? It replaced my 220,000 mile Ford probe I used for commuting back and forth to work. I still have 4 other vehicles as the range is the only limiting factor for the LEAF. My wife loves her 90 Celica, my daughter and I both have mid 80’s Fieros (mine is a fun project car) and a 85 F250. As you can see, I do not replace vehicles until they are totally worn out. This is the First brand new car we have ever purchased. A few years ago, I saw a Fiero here in Atlanta that someone had converted into an EV! Awesome, I would like to see that.